December 1985. This was my first southern Christmas. It was my first Christmas not with my Mom’s family and my first with 95% of my Dad’s family. 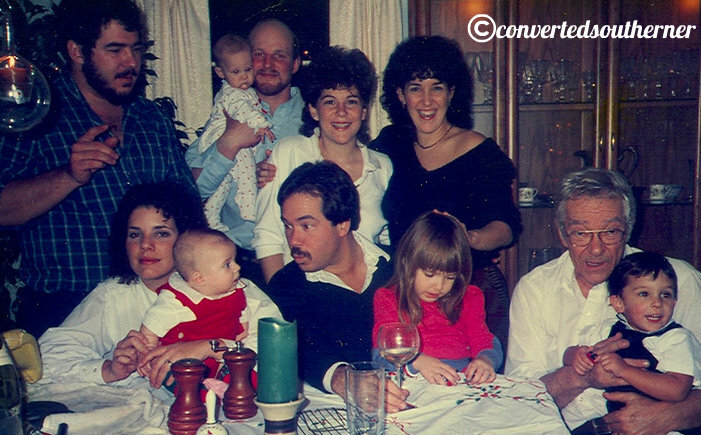 There are several cute pictures from that Christmas day at my Grandpa Bob and Grandma Pat’s house… but this one that is a total mess and totally hilarious seems the most appropriate to share when I consider this family. So, in the back going from left to right… we have my Uncle Brian- the professional photographer trying to get everyone to look at the camera. Then we have my Uncle John looking at the camera… like, how did I get pulled into this family? He is holding five month old Jenna who seems to be reaching out to grab a chunk full of my Dad’s hair below. We then have my Aunt Wen and Aunt Sue who are paying attention and probably a little happy from all the wine I’m sure was consumed (note the partial wine bottle cut out of the pic on the left). Sitting we have Holly (my Uncle’s first wife) giving the look of “take the damn photo already” holding five month old Blake… who is looking at my Dad who is making silly faces at him. Then we have me doing my own “I’m a princess, don’t tell me what to do” playing with the table cloth and then my Grandpa Bob holding a very wiggly toddler Dane and trying to get him to look at the camera. We never did get a full group picture with all of us looking at the camera. Typical crazy family. I had planned to do a whole smattering of pics from both sides of my family today, but looks like I need to by a new scanner. My old one doesn’t want to work with my laptop… stupid Windows 8. Hope each of you have a lovely Christmas!